This article first appeared in Personal Wealth, The Edge Malaysia Weekly, on April 8, 2019 - April 14, 2019. Singapore national Kelvin Lee had been working with JP Morgan for several years when he and his team were tasked with taking a mainland China-based mobile internet company public in 2012. It was a process he was eminently familiar with, having worked on no fewer than eight initial public offerings (IPOs) previously, including the famous Manchester United plc listing on the New York Stock Exchange (NYSE). Companies pursuing such a listing are usually required to engage in, often gruelling, roadshows to drum up interest in their IPOs. Since this company had chosen to list on the NYSE, the CEO and his team had to take a lot of time away from running the company to conduct roadshows in the US. It proved to be a frustrating experience and the CEO made his feelings known to Lee. Another thing that frustrated the CEO was the cost. “The IPO eventually raised about US$168 million, which is not actually much to a company from China. The CEO and his team had spent all that time away from the company, working with three underwriters, only to raise that amount. It must have felt like an unsatisfactory trade-off in the end,” says Lee. But the fateful outburst pushed him into a period of soul-searching. The more he considered the length of time and costs associated with raising capital, the more convinced he was that a solution was necessary. Lee resigned from JP Morgan in October 2014, less than six months after the Chinese company went public. There had to be a better route to the capital markets, he thought. And for the next year, that was all he and his co-founders thought about. “We spent that year just figuring out securities and exchange regulations. 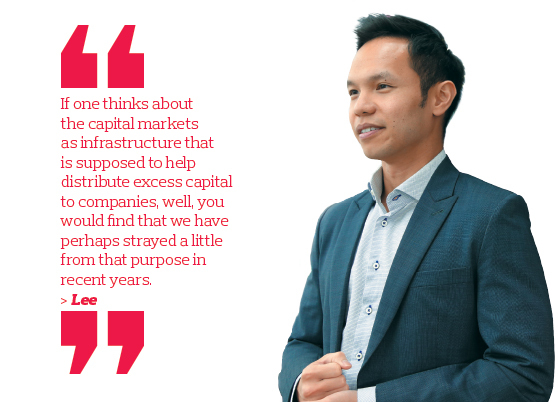 Eventually, we realised that there were aspects of the IPO process that could be made more cost-effective and timelier — but only with the prodigious use of technology and data,” says Lee. In the end, he resolved to walk away from the legacy investment banking scene altogether. Today, he and his co-founders Khai Lin Sng and Benjamin Twoon (who were part of the same team at JP Morgan) run Fundnel — a three-year-old private investment platform based in Singapore. Lee, Khai and Twoon are the company’s CEO, chief financial officer and chief operating officer respectively. By working with its network of investment banks and financial institutions, Fundnel offers investors various types of private investment deals, from equity offerings and stakes in venture capital funds to business loans and convertible bonds. One of its local partners is investment firm Midana Capital. A starting point would be to tackle the cost pressures associated with listing on a public exchange, Lee had thought. For example, on the Singapore Exchange’s main board, listing fees start at S$100,000 and can easily run up to twice that amount. There is also a non-refundable processing fee of S$20,000. On the secondary board, Catalist, listing fees range from S$30,000 to S$100,000 while the non-refundable processing fee is S$2,000. Lee also thought that technology could perform a good portion of the underwriting work, so that even in a risk-averse, post-global financial crisis environment, a company would not need to engage multiple underwriters for an IPO. Once all the costs — listing fees, underwriting fees, third-party fees and other ancillaries — have been factored in, the overall cost of listing would be between 8% and 10% of the funds raised from the public. He was convinced that he could cut much of that cost with Fundnel. By using technology to cut out intermediaries, Fundnel is able to keep costs low, says Lee. The platform charges a flat 2% success-based fee on total funds raised via the platform, in addition to a brokerage fee set by the investment bank that brings the company to the platform. These deals comprise unlisted securities in pre-IPO and growth-stage companies. Its investors make up institutional players such as private equity firms, venture capital funds, family offices and angel investor networks, as well as individuals looking to diversify their portfolios. These deals are priced in either the Singapore dollar, US dollar or, more recently, ringgit. There are no restrictions on other currencies. The company is licensed to operate in a number of countries. It has a Capital Markets Services Licence from the Monetary Authority of Singapore and approval from the Australian Securities and Investments Commission. Last year, Fundnel was granted Recognised Market Operator (ECF) status by the Securities Commission Malaysia (SC). This allows local investors to participate in offerings by Malaysian companies. Fundnel recognises several investor classes it considers qualified to participate in the investment opportunities on its platform. 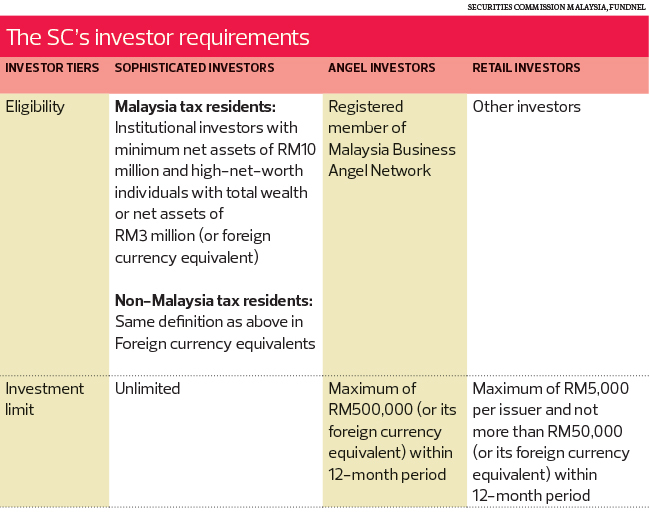 In Malaysia, it adheres to the SC’s definitions of sophisticated and retail investors (see table). First, Fundnel screens all investment opportunities to ensure that the businesses meet the minimum requirements, as defined by its proprietary due diligence process. This involves an artificial intelligence-powered analysis of more than 600 quantitative data points. Once completed, only deals that secure a lead investor are listed on the platform, at which point other investors are given the opportunity to join the investment round. “A lead investor is the initiating individual or corporate who makes the first move in committing an investment in a deal,” says Lee. The lead investor typically conducts due diligence and sets the terms and pricing for the investment round. Fundnel has seen several interesting companies successfully raise capital on its platform. A notable name is SpaceX — billionaire entrepreneur Elon Musk’s privately held advanced rocket and spacecraft manufacturing company — which raised US$20 million via an equity offering on the platform. The minimum investment amount was listed as US$250,000. Another interesting company is Travelio, an Indonesian start-up that runs an online marketplace for short-term home rentals. The portal, which lists properties in 25 major Indonesian cities, provides customers with professionally managed apartments, houses and villas. Travelio successfully raised US$2 million by issuing convertible bonds on the platform. The minimum investment amount was US$50,000. A Malaysian coffee roaster known as Union Roastery was recently listed on Fundnel. At the time of writing, it was looking to raise RM300,000 via a revenue-sharing model. According to platform, the revenue-sharing scheme, also known as C.Lever (short for Crowd Leverage), allows a business to receive investments from a group of investors. In return, the business commits to sharing a portion of its revenue. The minimum investment amount is RM10,000. Apart from the variety of deal types it offers, Fundnel stands out in the market because it is the first private investment platform in Southeast Asia to allow holders of unlisted securities to sell stakes. This helps provide liquidity to the overall platform and, in particular, gives early investors, family members and employees the ability to take profit. “On the issue of secondary liquidity, existing shareholders will be able to sell their shares on the platform via our network of brokerages. Price discovery will be driven by the market on a willing-buyer, willing-seller basis. In addition to the 2% flat fee on our end, brokerages will set their own fees,” says Lee. Fundnel — which was officially launched in January 2016 — completed 15 transactions in its first year, with about US$49 million invested via the platform. During the same period, Catalist saw 11 completed listings, with a total value of US$77 million. “To illustrate the cost differential, those 11 deals on Catalist required 12 banks to act as underwriters. Each of those banks has its own teams and salaries, all of which add up to the high cost. In contrast, Fundnel completed all of its investment deals with a total of three people working on our end,” says Lee. The automation capabilities provided by the platform reduces human effort and increases efficiency in company evaluations as well as the legalities of things such as disclosure, he says. The technology is designed to eliminate unnecessary red tape, thereby reducing the number of parties involved, resulting in an evaluation process that is quicker but just as detailed. “Thanks to technology, our platform enables disintermediation in the capital-raising process. We work directly with the fundraiser from start to finish — from the collation of key documents ahead of listing on the platform all the way to preparing the management team for investor meetings,” says Lee. Last year was a successful one for private investment platform Fundnel and its co-founder and CEO Kelvin Lee. The firm had achieved a total deal origination value of US$800 million as at end-2018. Fundnel has demonstrated an emphatic business case and Lee is raring to build on its early success. He wants to significantly increase the network of participating financial institutions and double down on technology investments to bring about even more cost savings. “As we entered our second year, we took stock of what we had achieved thus far and we wanted to provide the investment platform to as many brokerage firms and financial institutions as possible. We wanted to encourage them to bring down their cost structure, thereby lowering the cost barrier for companies seeking to raise capital,” says Lee. To this end, he announced the creation of the Hg Exchange in January. Touted as Southeast Asia’s first member-driven exchange, it will be built on distributed ledger (blockchain) technology. It is meant to support the issuance and trading of private company shares, including security tokens. Hg Exchange has signed a memorandum of intent with Philip Securities, PrimePartners, RHT Capital and Fundnel, with these entities thereafter becoming the first four members of the exchange. The idea here is that these players will funnel approved companies for listing on the exchange for subsequent trading by accredited investors and institutional investors. The more brokerage firms and financial institutions sign up as members of the exchange, the more vibrant it will be, says Lee. He says Fundnel will remain a private investment platform and continue to provide its services and functionalities to investors. The Hg Exchange will operate as a private board for sophisticated and institutional investors to trade unlisted securities. Simply put, while Fundnel seeks to capture investment opportunities from start-ups all the way to the pre-IPO stage, the Hg Exchange will ideally attract companies that would otherwise have raised funds through the public markets. “We named the exchange for the chemical mercury, which is identified on the periodic table of elements as ‘Hg’. Mercury is a semi-liquid metal and is meant to represent the increased liquidity that the exchange enjoys, thanks to blockchain technology, but also to distinguish ourselves from the traditional public markets, which are still more liquid than the Hg Exchange,” says Lee. Although it is possible for issuers and financial institutions to raise capital on Hg Exchange by trading traditional shares, the blockchain nature of the exchange means that an issuer can effectively digitise his company’s equity and raise capital by issuing what is known as a security token offering. Unlike initial coin offerings, a security token is a like-for-like digital conversion of a company’s real shareholding. Each security token represents a tangible percentage of ownership in the company that issues them, says Lee. From this, flow all the economic and legal benefits that traditional shareholding bestows on the owner. Hg Exchange was built by two major blockchain and digital asset developers — MaiCoin and Zilliqa — with the blockchain layer in the exchange set to facilitate ease of trading and settlement. The technology will also enable the exchange to verify and secure an investor’s security token shareholding. Hg Exchange has applied to the Monetary Authority of Singapore to be part of its fintech regulatory sandbox. Once the approval is received, the exchange will go live, says Lee.